"Brandon Gray" redirects here. For the domain name registry operator, see Brandon Gray Internet Services. Box Office Mojo is a website that tracks box office revenue in a systematic, algorithmic way. The site was founded in 1999, and was bought in 2008 by IMDb, which itself is owned by Amazon. The website is widely used within the film industry as a source of data. From 2002–11, Box Office Mojo maintained popular forums on its website. Brandon Gray began the site in 1999. In 2002, Gray partnered with Sean Saulsbury and grew the site to nearly two million readers. In July 2008, the company was purchased by Amazon.com through its subsidiary, the Internet Movie Database. From 2002–11, Box Office Mojo had forums, which were a popular place for box office "fanatics", and the site at one time was home to several popular movie games and quizzes, tests (e.g., Fantasy Box Office (created in 2006) and Create a Year of Movies), until these were summarily canceled for undisclosed reasons. Box Office Mojo had forums with more than 16,500 registered users. On November 2, 2011 the forums were officially closed along with any user accounts, and users were invited to join IMDb's message boards, even though not all the same features were available there. The IMDB forums were subsequently closed February 20, 2017. Tracking still follows closely to the day by day, actual tabulation of distributors, making it possible to see the general trend of a film's "earnings trajectory". On October 10, 2014, all traffic to Box Office Mojo was redirected to IMDb's box office page, before returning the following day. Queries about the closure to IMDb and Amazon representatives were met with no response. Neither Brandon Gray, who founded the website but left several years ago after its sale to Amazon, nor Ray Subers, the operator at that time, would respond either. On Ray Subers' Twitter[page needed] account, he revealed the website's return, but also stated he would not answer any questions pertaining to closure. Subers subsequently left the website seven months later. The international section covers the weekly box office of 50 countries and includes historical box office information from three more, as well as provides information for box office results for individual films from up to 107. The site also creates an overall weekend chart, combining all box office returns from around the world, excluding the United States and Canada. The overall weekend chart tracks the Top 40 films as well as approximately fifty additional films with no ranking. Box Office Mojo International also reports the release schedule of upcoming films for Australia, the Czech Republic, France, Germany, Japan, Lithuania, the Netherlands, the Philippines, Norway, Russia and the CIS, South Korea, China, Taiwan, the United Kingdom, and India. The site additionally has yearly and all time features for its various territories. However, Box Office Mojo does not include all the international films, especially some with high international box office, in the Mojo Yearly and All Time Worldwide Box Office Charts. ^ "Boxofficemojo.com Traffic, Demographics and Competitors - Alexa". www.alexa.com. Retrieved 2 October 2018. ^ "About Box Office Mojo" Archived 2010-11-19 at the Wayback Machine. Box Office Mojo. Retrieved June 17, 2018. ^ Eric Engleman (December 17, 2008). "Amazon's IMDb movie trivia site acquires rival Box Office Mojo". TechFlash. American City Business Journals. Archived from the original on 2018-07-01. Retrieved June 17, 2018. ^ Ben Fritz (December 15, 2008). "IMDB links up with Box Office Mojo". Variety. Archived from the original on December 19, 2008. Retrieved December 17, 2008. ^ ""Forums"". Box Office Mojo. Archived from the original on 2011-03-02. Retrieved June 17, 2018. ^ "Moviesboxoffice.in". Archived from the original on 2016-08-09. Retrieved 2016-07-03. ^ Jeff Sneider (October 10, 2014). "Box Office Mojo Redirecting to IMDb.com". The Wrap. Archived from the original on 2018-06-17. Retrieved June 17, 2018. ^ Natalie Jarvey (October 10, 2014). "Box Office Mojo Fate Uncertain; IMDb Remains Silent". The Hollywood Reporter. Archived from the original on 2018-06-17. Retrieved June 17, 2018. ^ Dave McNary (October 11, 2014). "Box Office Mojo Returns After One-Day Absence". Variety. Archived from the original on 2018-06-17. Retrieved June 17, 2018. ^ Michael Cieply (October 10, 2014). "With a Click, the Data Site Box Office Mojo Disappears". The New York Times. The New York Times Company. Archived from the original on 2018-06-17. Retrieved June 17, 2018. ^ "Twitter". Archived from the original on 2015-01-07. Retrieved 2014-10-12. ^ Jeff Labrecque (October 13, 2014). "Box Office Mojo is back online, and its editor isn't taking questions". Entertainment Weekly. Archived from the original on 2018-06-17. Retrieved June 17, 2018. ^ "Twitter". Archived from the original on 2016-03-07. Retrieved 2015-09-15. 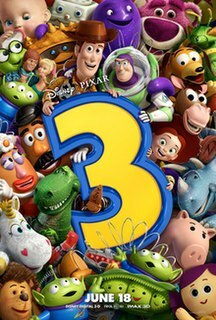 Toy Story 3 is a 2010 American 3D computer-animated comedy-drama film produced by Pixar Animation Studios for Walt Disney Pictures. It is the third installment in Pixar's Toy Story series, and the sequel to 1999's Toy Story 2. It was directed by Lee Unkrich, the editor of the first two films and the co-director of Toy Story 2, written by Michael Arndt, while Unkrich wrote the story along with John Lasseter and Andrew Stanton, respectively director and co-writer of the first two films. Pirates of the Caribbean: At World's End is a 2007 American epic fantasy swashbuckler film directed by Gore Verbinski, the third in the Pirates of the Caribbean film series and the sequel to Dead Man's Chest (2006). The plot follows Will Turner, Elizabeth Swann, Hector Barbossa, and the crew of the Black Pearl rescuing Captain Jack Sparrow from Davy Jones' Locker, and then preparing to fight the East India Trading Company, led by Cutler Beckett, who controls Davy Jones and plans to extinguish piracy forever. It is the last film in the series to be directed by Verbinski. It was filmed in two shoots during 2005 and 2006, the former simultaneously with Dead Man's Chest. With an estimated production budget of $300 million, Pirates of the Caribbean: At World's End was the most expensive film ever made at the time of its release, even after adjusting for inflation. Space Station 3D is a 2002 Canadian-American 3D short documentary film about the International Space Station written, produced, edited and directed by Toni Myers. Narrated by Tom Cruise, it is the first IMAX 3D production filmed in space. Digital Photography Review, also known as DPReview, is a website about digital cameras and digital photography, established in November 1998. The website provides comprehensive reviews of digital cameras, lenses and accessories, buying guides, user reviews, and active forums for individual cameras, as well as general photography forums. The website also has a large database with information about individual digital cameras, lenses, printers and imaging applications. Originally based in London, Digital Photography Review and most of its team relocated to Seattle, Washington, in 2010. It is currently owned by Amazon. Road to Nowhere is a 2010 American romance thriller independent film directed by Monte Hellman, written by Steven Gaydos, and starring Cliff De Young, Waylon Payne, Shannyn Sossamon, Tygh Runyan, and Dominique Swain. It is Hellman's first feature film in 21 years. Tim Burton is an American film director, producer, artist, writer, animator, puppeteer, and actor. He is best known for his dark, gothic, and eccentric horror and fantasy films.